Listing of All Stirling Hotels in Scotland with Websites , Phone Numbers , Images and links to Maps , Top Restaurants and Reviews. Stirling Area Click on Map for Attractions & Mountain Hiking. Also listed are links to B&Bs , Self Catering, Websites & Shops . Stirling Highland Hotel & Restaurant AA 4 Star, 0.3 of a mile west of Stirling town center on Spittal Street close to the castle. The Stirling Highland Hotel is regarded as the most prestigious hotel in the city with a leisure centre and award winning Scholars Restaurant. Phone number 01786 272 727. 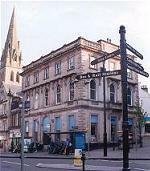 Hotel Colessio SC 4 Star, in the centre of Stirling on Spittal Street close to the castle. A landmark building in Stirling, Hotel Colessio has been transformed to offer unrivalled luxury and facilities. Phone number 01786 448 880. Express by Holiday Inn Stirling VS 3 Star, 1.8 miles east of Stirling town center in Springkerse Business Park. A modern and comfortable hotel, with easy access to the town and all Stirling’s famous attractions including Stirling Castle and the National Wallace Monument.. Phone number 0871 902 1628. King Robert Hotel & Restaurant VS 3 Star, 2 miles south of Stirling town center on Glasgow Road. Situated on the site of the Battle of Bannockburn, next to the Bannockburn Heritage Centre, a friendly and excellent value family hotel. Phone number 01786 811 666. Stirling Court Hotel VS 3 Star, 3 miles northeast of Stirling town center at the University of Stirling. The hotel offers a range of excellent facilities including: conference facilities, exhibition space, restaurant and banqueting services. Phone number 01786 466 000. Allan Park Hotel & Restaurant SC 3 Star, 0.3 of a mile southwest of Stirling town center on Allan Park. A family run hotel with 9 rooms in a quiet town centre location. All rooms with private facilities and satellite television. Conservatory restaurant. Private parking. Phone number 01786 473 598. Willy Wallace Hostel SC 3 Star, in the centre of Stirling on Murray Place. Willy Wallace Hostel is friendly well-run cheap accommodation in an attractive Victorian building next to the train and bus stations in the town centre. Phone number 01786 446 773. Cook's of Stirling SC 4 Star, 0.4 of a mile east of Stirling town center on Upper Craigs. Cook's of Stirling is a popular destination for eating and drinking or just getting together with friends. Phone number 01786 430 890. Golden Lion Hotel SC 2 - 3 Star, in Stirling town center on King Street. An excellent city centre location within easy walking distance of main bus and rail station, and only a few minutes drive from the motorway. Phone number 01786 475 351. The Portcullis VS 3 Star, 0.5 of a mile northwest of Stirling town center on Castle Wynd. Situated beside Stirling Castle in the "Old Town" of Stirling with views over the town and to the Ochil Hills beyond. All en-suite rooms are equipped with central heating, tea & coffee making facilities, telephone and television. Phone number 01786 472 290. Premier Inn Stirling City Centre SC 3 Star, 0.5 of a mile east of Stirling centre at Forthside Way. One of our new generation bedrooms, each featuring a 40" flat screen TV, freshly-updated bathroom, and brand new, slumber-inducing, king-size Hypnos beds. Phone number 0871 527 9472. Premier Inn Stirling South SC 3 Star, 3 miles south of Stirling centre at Whins of Milton off Glasgow Road. This hotel has rooms adapted for customers with disabilities. High speed internet access is available in this hotel by WiFi for a small fee. Great value food at all our restaurants. Phone number 0871 527 9038. Travelodge Stirling M80 SC Budget, 3 miles south of Stirling centre Situated off junction 9, M9/M80 Motorway at the Moto Service Area, Pirnhall. Free on-site Parking. Accommodation prices listed do not include Breakfast. Phone number 0871 984 6178.